Here’s a great gift idea for someone — a customized desk calendar! You can personalize it with your own photos and make it truly one of a kind. 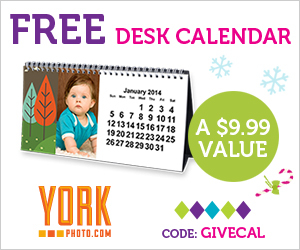 Right now, you can get a desk calendar for FREE from York Photo! That is a savings of $9.99. Create your calendar and use the code GIVECAL at checkout. You will have to pay shipping charges of around $3.99 + any applicable sales tax. However, this is still a great value! This offer is available only for new York Customers, so if you have ordered from them before, you will not be able to get this promotion. If you are new, you will not only receive this offer, you will get 40 free 4×6 prints just for signing up! Visit York Photo to learn more!